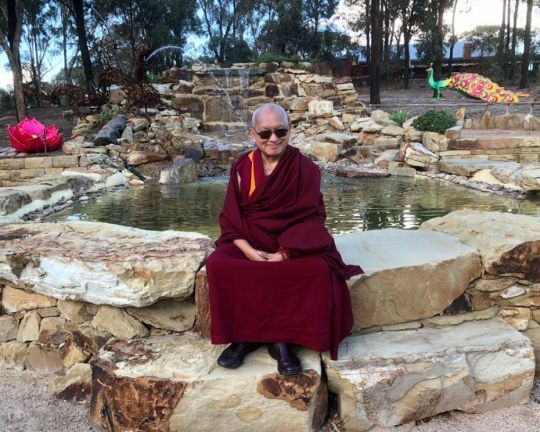 Lama Zopa Rinpoche in the Peace Park at the Great Stupa of Universal Compassion, Bendigo, Australia, May 2018. Photo by Ven. Roger Kunsang. From the bottom of my heart, thank you all numberless times for all your service, dedication, practice of holy Dharma with your body, speech, and mind, and for your devotion and good heart. Or even in a dream and in this way the karma finishes. This means that the heavy karma that otherwise would have resulted in you being born in the lower realms, for so many eons, it all gets finished by serving the guru. All this gets totally purified by receiving a scolding, being teased, or even just having a dream. This means all those heavy negative karmas would have otherwise resulted in wandering in the evil gone realms for an unfathomable amount of time. What happens if you are not aware of the most unbelievable benefits of correctly following the virtuous friend? If you are not aware and not thinking, then you think it is very bad, you regard it as very bad. But by recognizing and knowing these points then you understand that it is the most incredible purification and way of collecting merits and actualizing the path. It makes it so easy to actualize the path and to achieve enlightenment easily and quickly. This is something to rejoice in and to feel incredible happiness about. One’s whole practice is serving the guru. Whether following advice; doing commitments; making offerings of flowers, water, lights, incense, which are done with so much devotion and respect to the Triple Gem; offering one’s own time and practice, so every single thing that you do is service; then also offering other service such as being director, co-director, coordinator, spiritual program coordinator, bookkeeper, office person, cleaner, translator, book editors, and so forth, past and present—everything that you do is offering service. Colophon: Scribe Holly Ansett, Buddha Amitabha Pure Land, Washington, US, August 2018. Lightly edited for inclusion in the FPMT Annual Review 2018. *The FPMT Annual Review 2018 is available in digital format only, meaning it will not be printed and posted to FPMT centers, projects, and services.